The Kishu Railway runs through Gobo City on the nature-filled coastline of Wakayama Prefecture. The line has been an indispensable transport service for the locals of Gobo, which is surrounded by the sea and mountains and has a river running through it. Established as Gobo Rinko Railway, Inc. in 1928 in collaboration with rich local families to provide citizens with a convenient means of transport from Gobo Station of the JR West National Railway to the city, the Kishu Railway celebrated its ninetieth anniversary in 2018. The railway operates one-car trains that are just over fifteen meters long and carry up to ninety-four passengers. Connecting Platform 0 of JR Gobo Station and Nishi-Gobo Station, they shuttle back and forth twenty times a day. The distance traveled is just under three kilometers, and a one-way journey takes just eight minutes at speeds of about twenty to thirty-five kilometers per hour. Between Gobo Station and Kii-Gobo Station, the line runs through rice fields, but once it leaves Kii-Gobo Station for Nishi-Gobo Station it passes right by residential homes. What riders love most about the Kishu Railway is that they can take in both the pastoral countryside and a retro and bustling city view on a single leisurely jaunt. There are only three stops along the way: Gakumon Station, Kii-Gobo Station, and Shiyakusho-mae Station. However, all three are convenient for reaching local government offices, schools, hospitals and libraries. The railway typically carries commuters and schoolchildren in the morning and evening, and people going to the hospital during the day. The line boards around three hundred passengers a day on average, but on rainy days it is often packed during rush hour. The locals all agree that the service is indispensable to their lives, and say they feel somehow empty if they don’t ride it for a while. Seniors love to see their grandchildren enjoy the ride when they come over, and still call the railway “Rinko,” just as it was known years ago. The railway runs parallel to a national road with a bus service, but regulars take their time, schedule and distances into consideration and use whichever suits them better. Recently more passengers are coming to the area to sightsee. 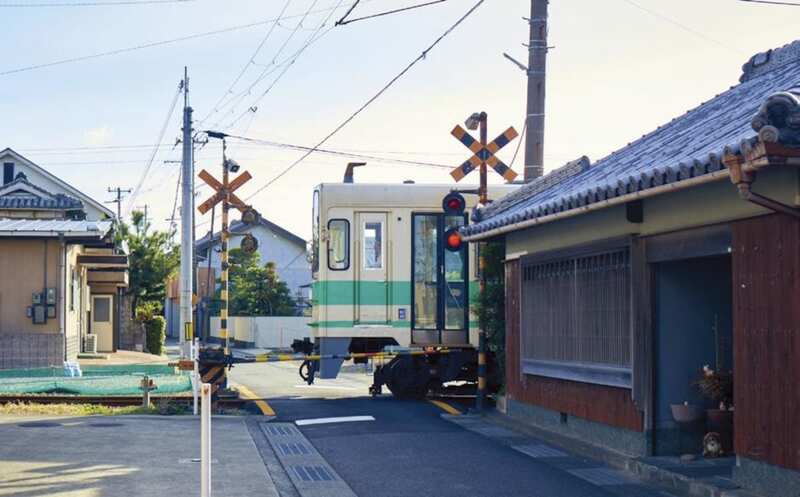 Besides railway enthusiasts, the line has now become a “sanctuary” for anime fans as well ever since one anime series featured the area around Gobo Station. Nishi-Gobo Station is surrounded by a temple town built by the followers of Hoganji Hidaka Betsuin Temple, which has a great historical feeling to it. Horikawaya Nomura is considered one of the best soy sauce shops around, even in Wakayama, the birthplace of soy sauce. Visitors can purchase premium-quality soy sauce as well as miso, and may also peek inside the storehouse if they wish. Dojoji Temple, the oldest temple in Wakayama Prefecture and made famous by the legendary Anchin and Kiyohime characters featured in a famous kabuki play, is also a great spot to visit, and only about twenty minutes from Gobo Station on foot. “Take a picture of our train in motion against your favorite background after you get off, and it will become a special spot for you,” says Shigeyuki Okaji, the railway’s vice president. It’s also fun to get off at one of the three interim stops and stroll around the station. For example, just along the street in front of Kii-Gobo Station you can stop by Marukin Seiniku Honmachiten, a well-established butcher shop long favored by locals. Get a fresh special croquette at the counter and enjoy its homey flavor while walking around town. You might even discover a new side of Gobo not yet featured in guidebooks. 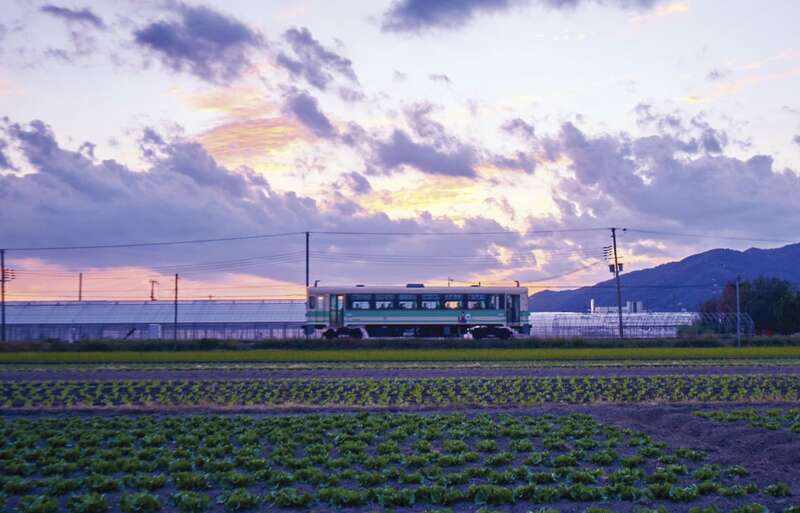 Take the Kishu Railway across peaceful green fields and a city that somehow feels familiar, and you’ll experience a heartwarming trip through the Wakayama way of life.